Someone recently asked a question about solving cryptograms and I had recalled reading an article about MIT students creating a cryptogram solver that used some kind of pattern matching. i figured it was interesting enough to give a go at it. Below is my result, and can be improved up. This code is the core of the example linked in the section below, in order to see an example of it's implementation, you will need to download the example project below.
''' 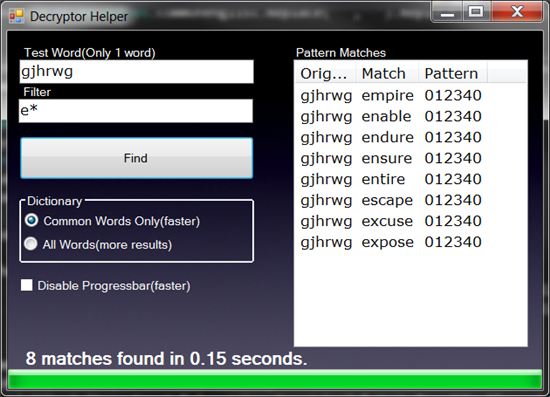 This function calculates likely word matches for cryptogram words. Const Legend As String = "01234567890ABCDEFGHIJKLMNOPQRSTUVWXYZ"
Dim map As New List(Of pt), I = 0, WordPattern As String = ""
Dim map2 As New List(Of pt), I2 = 0, DictPattern As String = ""
UpdateLabel.Text = results.Count & " matches found so far..."
Please view my other wiki articles! Please update this article if you see any mistakes.